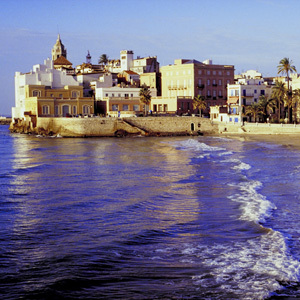 This vacation is perfect for those who wish to experience all the excitement and energy of Spain. You’ll visit Spain’s most popular cities, including Madrid, Barcelona, Valencia, Granada, Vitoria, Pamplona, and Seville. You’ll have time to relax on the Costa del Sol, where you can sample traditional Spanish cuisine, walk on the sandy beaches, and browse the trendy boutiques. You’ll also visit the Rock of Gibraltar, in British hands since 1704. On this Spain tour, history fans will enjoy visiting the Alcazar in Seville, founded in the 11th century as a Moorish fortress; the 8th-century Mosque of Caliphs in Cordoba, a very well-preserved mosque that was converted into a cathedral in the 13th century; and the Alhambra Complex in Granada. 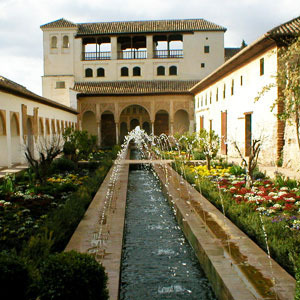 The Alhambra was a palace, citadel, and fortress for the Nasrid sultans and their servants, elite soldiers, and high officials from the 13th to 14th centuries. Fans of art and architecture will delight in seeing the Prado Museum in Madrid, one of the world’s finest art museums; the Guggenheim Museum in Bilbao, an amazing feat of construction without any flat surfaces; and the Sagrada Familia Basilica, Gaudi’s masterpiece in Barcelona. We have also arranged special experiences for you on this Spain tour. For example, enjoy wine tasting accompanied by tapas in Ribera del Duero. A special treat is a walk along the street where the famous “running of the bulls” takes place, followed by a Rioja wine tasting and dinner at a local restaurant in Pamplona. History, art, architecture, beaches, Spanish food, and more—what more could you ask for in a vacation to Spain? The capital since 1561, Madrid today is a strikingly modern city, the showcase of a country resolutely turned towards the future. Morning sightseeing with a Local Guide takes you to the Puerta del Sol, Plaza de España with its monument to Cervantes, the Parliament, Cibeles Fountain, elegant Calle Alcala, and Paseo de Castellana. Then, the highlight: a visit to the palatial PRADO MUSEUM with its priceless art treasures. In the afternoon, an optional excursion to Toledo can be arranged. Head into beautiful Castile, the “Province of the Castles.” Cross the rugged Sierra de Guadarrama mountain range on the way to Segovia, famous for the 2,000-year-old Roman aqueduct. Next, head to Ribera del Duero for a wine tasting accompanied by tapas at Bodega Portia, designed by the world-famous architect Norman Foster. In Burgos, see the magnificent limestone Cathedral of Santa Maria, where legendary El Cid is buried. Afternoon arrival in Vitoria with time for a stroll through this ancient Basque city’s delightful historic center. In Bilbao, the great port city of the Basque region, enjoy a special highlight: a guided visit to the GUGGENHEIM MUSEUM, an amazing feat of construction created by architect Frank O. Gehry. Next is lovely San Sebastian, the “Pearl of the Cantabrian Coast,” before arriving in Pamplona at the foot of the Pyrenees. Here, a special treat awaits you: enjoy a walk along the Calle Estafeta, where the famous “running of the bulls” takes place, followed by a Rioja WINE TASTING and dinner at Basaburua restaurant. Sightseeing with a Local Guide features the Columbus Monument, Plaza de Cataluna, and Paseo de Gràcia. Highlight is a visit to spectacular SAGRADA FAMILIA BASILICA, Gaudi’s masterpiece. Also enjoy a panoramic view of the city and harbor from Montjuïc Hill. To enhance your stay, choose from our optional excursions to Montserrat and to a Catalonian restaurant to try out local dishes. Along the coast to Valencia, once a royal capital. Valencia’s Roman, Moorish, and Spanish history comes alive during your guided orientation drive including the Town Hall, La Lonja (the 15-century Silk Exchange), the bull ring, the massive gateway towers of Serranos and Quart, and the new Arts & Science Complex, designed by the famous Valencian architect Calatrava. End your tour in the center at La Seo Cathedral and then, enter one of Valencia’s oldest Horchaterias, where you will be served a traditional Horchata drink. A scenic drive towards the mountains past troglodyte cave dwellings, hollowed out of the soft tufa stone, near Guadix and Purullena. Cross Mora Pass and arrive in Granada, where a special dinner with wine awaits you at one of Granada’s fine restaurants, the perfect introduction to this magnificent city. Sightseeing with a Local Guide features Granada’s main attraction, the ALHAMBRA COMPLEX, a fantasy of “lace in stone” surrounded by arabesque gardens and fountains. Also amble through the exotic WATER GARDENS OF THE GENERALIFE. Then, a short drive down to your hotel at the Costa del Sol. Later, you may wish to join an optional excursion to the charming Pueblo Blanco village of Mijas. Morning excursion to beautiful Malaga. Join your Local Guide on a walking tour through the OLD CITY. Enjoy free time for shopping and maybe a visit to the Picasso Museum. Drive to the ROCK OF GIBRALTAR, in British hands since 1704. Hear about its turbulent history from your Local Guide, see the Moorish Castle, and visit ST. MICHAEL’S CAVES and the colony of Barbary apes. Then, on through the sunny sherry wine region on the Costa de la Luz to vibrant, festive Seville, where an exclusive visit has been included to the famous Real Meastranza de Caballería de Sevilla, the royal BULL RING. During your sightseeing tour with a Local Guide, hear about the city’s role in Roman times, its conquest by the Moors in 712 AD, and its contribution to the discovery of the New World. Admire Maria Luisa Park, the Golden Tower on the Guadalquivir River, and the university that used to be the tobacco factory of Carmen fame. Also visit the ALCAZAR, founded in the 11th century as a Moorish fortress, with its Palacio de Don Pedro. Then, stroll through the narrow lanes of the charming SANTA CRUZ QUARTER. For those interested, an optional extended guided visit to the cathedral is available. Tonight, for a truly Andalusian night out, reserve a seat at our optional Flamenco show. Through the arid landscapes of Don Quixote’s La Mancha to Cordoba.During your guided walking tour of Cordoba, see the Alcazar, the Roman Bridge, and the medieval Jewish quarter. Tour the magnificent 8th-century MOSQUE OF THE CALIPHS, famous for its 850 pillars of porphyry, marble, and jasper. Return to Madrid. Tonight, enjoy a farewell dinner with wine at your hotel. July 4 & July 11 Departures – San Fermin Feria in Pamplona. Catalonia Atocha Hotel is located in the center of Madrid, near Paseo del Prado and Atocha Railway Station, and only a short distance from the main museums and tourist attractions of the capital. The hotel was inaugurated in 2011 and has a fantastic solarium and terrace with heated seasonal Jacuzzi and wonderful views of the city. Modern hotel with meeting rooms, bar-cafeteria and restaurant; in a park and garden setting, overlooking the Cathedral. High-rise Hotel situated in city center, within walking distance from Historic Center & university campus. A large modern 338 room property, located within easy access to many of the city’s major sights and attractions. Facilities include a choice of two restaurants a gym and a seasonal rooftop swimming pool and sun terrace with panoramic city views. MA Nazaríes, with impressive modern architecture, is a contemporary hotel. This is a special, unique city and Ayre Hotel Sevilla welcomes you. Not only is the hotel near the center of Seville, it is also the closest hotel to the AVE Station, one of the nearest to the Conference Centre and to San Pablo International Airport, not to mention just moments from the business and shopping district of Nervión. Smart Business-oriented Hotel of modern construction, near American Embassy in Barrio de Salamanca. Excursion to Toledo Admire Castilian landscapes on your way to the beautiful imperial city of Toledo. It is one of the oldest towns in Europe and its genuine Spanish buildings are a showcase of almost all periods of history (Arab, Gothic, Mudejar, Renaissance, and Baroque styles). Visit the 13th-century gothic cathedral, Church of Santo Tomé with its masterpiece by El Greco, the synagogue, and a Damascene steel workshop, a technique that inlays precious metals into steel. Beautiful Barcelona Together with your local expert explore the Ciutat Vella district (old city); the Barceloneta, an 18th-century traditional district of sailors and fisherman; the Olympic Village, constructed for the 1992 Olympic Games, with the Olympic Port and beaches and magnificent views of the harbor and the neo-Moorish-style Arc de Triomphe. Don’t miss out the experience of walking down the famous La Rambla to visit the Boqueria Market the oldest food-market in Spain, where the best “chefs” buy for their Michelin Restaurants and where you will enjoy one of the popular fresh fruit juices (included in the tour). Excursion to Montserrat Drive through picturesque villages to 4,320-foot Montserrat with its impressive Benedictine monastery perched halfway up the mountain. Visit the Royal Basilica, one of Spain’s most important pilgrimage sites for hundreds of years due to its famous 12th-century Romanesque carving of the Virgin Morenita (Black Virgin). Glimpses of Granada With your Local Guide, discover the cathedral of Granada, considered to be one of Spain’s most important renaissance buildings. Visit the richly decorated Royal Chapel, built between 1505 and 1521 and which houses the mortal remains of the couple who unified Spain under one monarchy Queen Isabella of Castile and King Ferdinand of Aragon. Then, visit the Carthusian Monastery, an outstanding example of baroque architecture with its intricate white stucco works. Construction began in 1516 and continued for the next 300 years, but the project was never completed. The monastery was home to a community of monks and laymen who lived under a vow of silence. Finally, enjoy a beautiful view over the Alhambra and the city from the famous El Albaicín old Moorish quarter. Mijas & Dinner On The Carihuela Drive to the enchanting village of Mijas, nestled in the mountainside at 1,404 feet (428 meters) above sea level. Enjoy a walking tour, then free time for shopping or admiring its cobblestoned, narrow winding streets, dazzling whitewashed walls, and breathtaking views. Later, enjoy a 4-course dinner, with drinks, at one of the celebrated restaurants in La Carihuela, the original fisherman’s district in Torremolinos, famous for the best seafood in the region. Andalusian Dinner & Flamenco While savoring a 3-course Andalusian dinner with drinks, enjoy an exciting flamenco show. The flamenco dance, with its roots in Indian, Arabic, and Spanish cultures, is a highly-expressive, passionate dance form that no visitor to Spain should miss. Cathedral and Columbus Tomb Standing on the site of a grand mosque, Seville’s 15th-century gothic cathedral was built to demonstrate the city’s power and wealth after the Reconquista, when the city was captured from the Moors. It is the third-largest church in Europe and boasts 80 chapels, the largest altarpiece in the world, and the breathtaking La Giralda, one of the three remaining Almohad minarets in the world (the others are in Marrakesh and Rabat, Morocco). This beautiful structure became the bell tower of the cathedral, and dominates the city’s skyline. The cathedral also houses the remains of explorer Christopher Columbus. Although originally buried in Havana’s cathedral in Cuba, his first discovery in 1492, his remains were moved to Seville during the upheavals surrounding the Cuban Revolution in 1902.